Built on the banks of river Wangchu, the Centenary and Coronation Park was created to commemorate a century of monarchical rule in Bhutan as well as the ascension of the fifth King of the country, Jigme Khesar Namgyal Wangchuck. 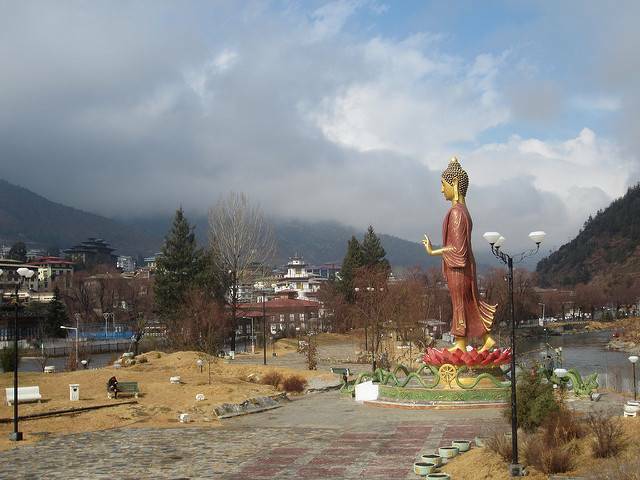 Positioned in the middle of the Changlimithang ground, the Park occupies a sprawling area of nearly five acres of land. Strewn with canopies of lush greenery, it is home to at least sixty different varieties of flowers which lend colour and charm to it. Besides boasting a diverse landscape, the main attraction of the Park is undoubtedly the giant statue of the Walking Buddha, who stands at a height of 45 ft. on a lotus with druks or dragons encircling it. The statue is an impeccable work of art, reflecting the rich Bhutanese culture. The beauty is enhanced during the evening time with luminescent lights fitted in the park. The park is not far from the Clock Tower Square and is an ideal place to spend quality time with family.